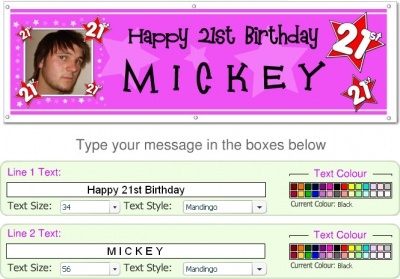 Partybox have a brilliant feature on their website which I had not noticed before; A giant personalised banner creator! It's really easy to use and allows you to add up to 3 lines of text (changing font, size and colour) and also upload a mugshot for the birthday guy/girl! Wait, here comes the best part.... The smalles version of this banner which will fit at the top of a door is just £6.99. The larger size (2 metres long) is only £18.99. They do offer a 'giant size too' however this comes in at a price of £43.99 and is just a metre longer.